I love farm animals. Especially goats, pigs, and donkeys. Shortly after moving to Austin, we sought out a place called The Natural Gardener to buy fire ant killer that would be safe for our dog. We poked around the garden area for a while, marveling at the cute little herb garden and rustic wood swing, only to discover that this place was also home to butterflies, chickens, owls, rabbits, goats, and donkeys. 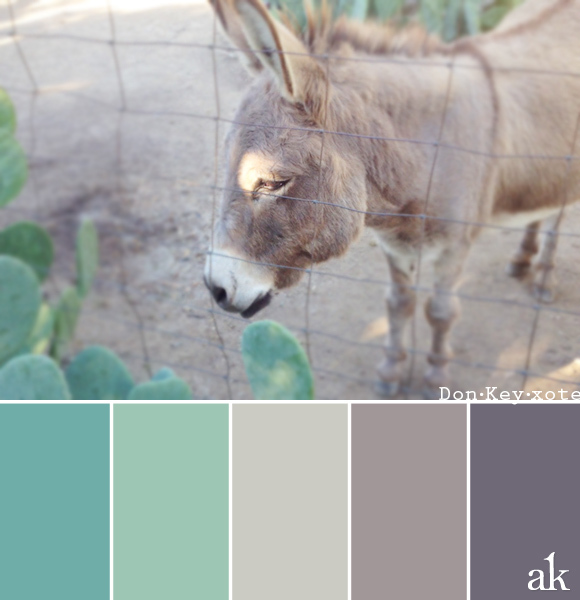 This week's color inspiration is based on one of the amazing donkeys at TNG. The reddish-purple-grays of his coat look great against the greens and blues of the cactus.